Poppies are probably my favorite annual to grow in my garden because they're dependable flowers, attract bees, and grow in poor soil. I've blogged about how I sow poppy seeds in the garden, but they're prolific self-seeders too. Poppy seeds remain for years in the ground and will sprout when the soil is turned over and they're exposed to sunlight. While I save poppy seeds from my garden, I let most fall to the ground and self-sow. The one downside of self-seeding poppies is that they'll germinate in clumps which grow weaker poppies, but I've found transplanting poppy seedlings into other areas of the garden to be pretty easy after some observation and experimentation. I have to preface what I'm about to say by noting that poppies are notoriously difficult to transplant. Poppies, as you'll see below, have long taproots like carrots that do not take to be disturbed. That being said, if you find them in the garden early on you can safely transplant the seedlings into other areas where there's more space for them to grow or where you'll be able to enjoy the flowers. The first step in poppy transplantation involves learning to identify the seedlings among all the other seedlings in your garden. Papaver somniferum (annual poppy) seedlings are rather easy to identify because the leaves look like little lettuce leaves. In the picture above the poppy seedling is in the center of the photograph and if you study the photo you'll see the leaves are different than all the leaves around it. The second step involves remembering that the taproot is really long and you'll need to excavate down a few inches. I plunge the hand trowel into the soil as far as possible before lifting the poppy seedlings in an attempt to ensure that I've I have not disturbed the root. The bigger the core sample of soil around and below the seedling the better the odds are that your seedlings will survive the move. 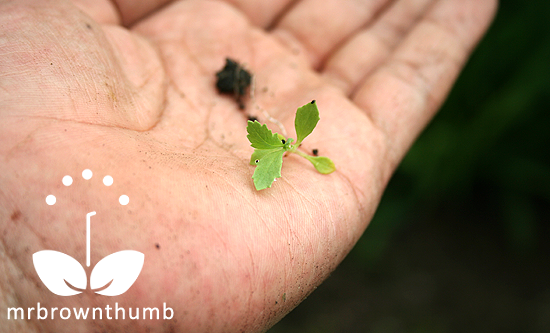 When you're positioning the seedlings into their new spot slide the clump of soil into the ground as gentle as possible. After careful transplanting your poppy seedlings will benefit from a being watered. Here is an example of a poppy that is a little "long in the tooth" for transplanting. This seedling already has four true leaves and the taproot is as long as the palm of my hand. There's a 50/50 chance that a seedling at this stage of growth will not survive transplanting because the root could be damaged in the process. A poppy seedling at this stage of growth is an ideal candidate for transplanting. The first set of leaves have barely emerged and the root isn't too long. When transplanting annual poppies in the garden success isn't guaranteed but with some trowel and error (HA, get it?) your percentages improve and you get a better crop of poppy blooms and seeds in the garden. The best time to do this is really early in the spring when the seedlings are still young and on days that call for rain. 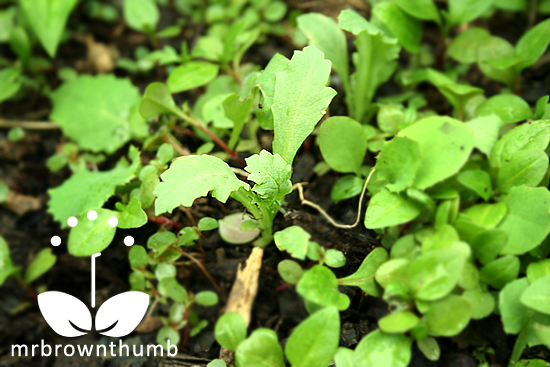 The extra humidity and moisture will help the seedlings endure the shock of being transplanted. If you want to transplant Papaver orientale, the perennial poppy, the best time to do that is in August when the plants are dormant. Perennial poppy clumps only need division every 4-5 years. Besides learning when to sow poppy seeds and when to harvest poppy seeds there's not much to learn about growing poppies. They grow in poor soil and like full sun and in my garden at least I've found them to be very drought tolerant. I have self seeing poppies. I usually let them bloom where they wish but sometimes, they park themselves in the middle of the path. Your transplanting advice is much appreciated. I've always heard they're difficult to transplant as well. I don't have any growing in my garden, but I did buy some seeds this year. Any plant that self-sows is a winner in my book - I love not having to seed them. Thanks for the reminder to head out and sprinkle all those poppy seeds in the dry areas of the garden. Thanks so much! It can be tedious, but the poppy transplant is possible, I've done it with all of my poppies so far. I've never had any luck with poppies, but I did plant a couple of packages of them this spring. I will remember this in case they 1) bloom and 2) manage to self seed. I'd happily take two flowers! thanks. @Gardener on Sherlock Street, I've been known to fence a poppy seedling that has sprung up in the middle of a path. What I don't like is when they sow underneath something that shades it out and then they get stunted. @Chiot's Run, You're welcomed. Hope you get some nice blooms. @Mary C. Yes, it is tedious as heck. Hunting the garden for stray seedlings and pulling up "plugs" of soil. I wonder if this is what the people who do hair transplants feel like. @Webb, Good luck to your and your poppies. Hope you get a tone of blooms. I have not grown poppies before. I will remember the long taproot. Thanks for showing and your detailed explanation! Usually I transplant after a rain or deep watering. 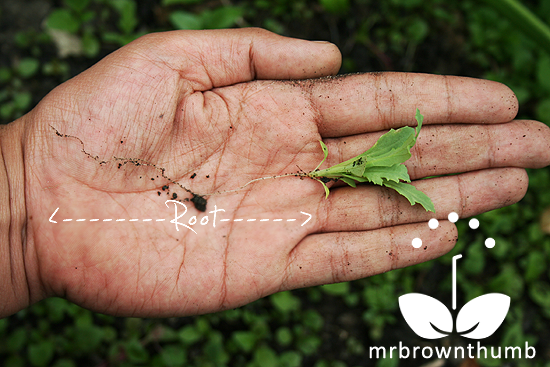 I think when soil is softer, it will lessen the risk of root breaking in the process of transplanting. Poppies can be tricky. I haven't had much luck with them myself, but I am giving them a shot again this year. Thanks for posting about this - I recently got a ton of different varieties of poppies for Christmas, and didn't know the best way to transplant them if sowing them all in one area. I think I'll sow them further apart to avoid the transplanting process all together. Thanks - you're awesome! Thanks for the Tip! I didnt know moving was possible! I just wrote on my blog a reminder to me to plant some california poppies next year near the driveway....I have many coming up from soil at my old place...anxious to see the varieties that are in the new place too! Thanks for visiting my blog.The tree that you so liked in my header photo is a Labernum - native to the UK, poisonous but beautiful! @Stephanie, You're right, the soil after rains is softer and the plants easier to transplant. @Mary, I hope you do because I think they're great plants in the garden. @Garden Hoard, LOL. You're welcomed! Yes, spread them out thin and into the areas you want them so you don't have to deal with transplanting the seedlings. @Motormouth, You're lucky to have free poppies coming up. I'll have to keep up with your blog to see what kind of poppies you have. @Nutty Gnome, Wow, thanks for the info on the tree. That makes me like it even more. @Nakhoda, Good luck with the transplanting! Can you shed some light on this situation? sLucey, Annual and perennial poppies are two different types of poppies. Annual poppies go to from seed to seed within a certain amount of days regardless of region. They will not return the next year from the roots next season like perennial poppies do. I have two 4-year old poppies that are huge. This year, the neighbor's young husky managed to smash into them just as they were budding- while leashed! I still got a few flowers but the plant looks like hell. S'okay. I was planning on moving them in August anyway. Note to self: Do not let that idiot onto property again. Grrr! PS: Thank you for visiting my blog, Mr. Brownthumb! Mr Brown Thumb would you be able to send me some poppy seeds. I tried them twice but with no success. I really hope that if I try your suggestions it would work. How can I get some of your seeds? Poppies do look a little messy if you have a lot of them going to seed, right? They also get stunted if they're shaded out by other plants. I had to transplant after people started cutting off my flowers I hope it survives in new location! any tips? 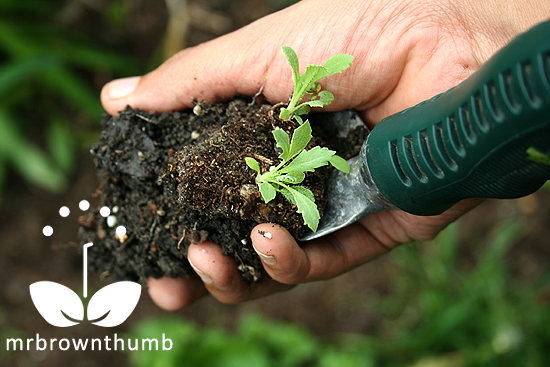 When transplanting a plant, make sure you transplant to the same depth. 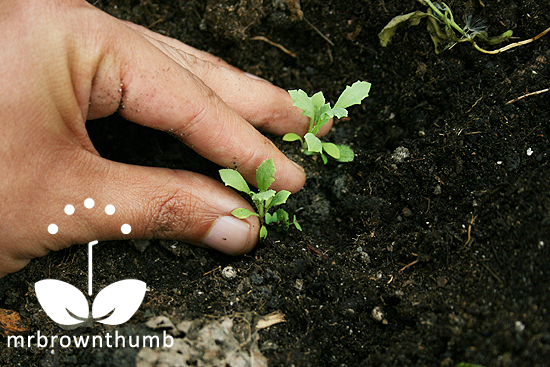 Dig wide and deep enough about the plant to get as many roots before digging it up. Keep the transplant well-watered so it doesn't dry out. I have to agree with a lot of the advice already present here. Growing poppies is a lot of fun. They are one of the most beautiful available. Here in Canada, they are a highly cherished garden favorite. I grow both the annual and the perennial varieties. As MrBrownThumb suggests, if you have a large number of the annual variety available to transplant, allowing for some loss, go for it. However, if it is just a little patch, better to leave them alone. Perennials such as the Icelandic and the Oriental are great to start in doors and much more tolerant of being placed outside. To make true perennials out of them though you really have to be careful with mulching them and protecting the roots throughout the year. It is very easy for them to dry out too much before winter or become to soggy, causing root rot. I can definitely understand growers being dissatisfied with the short bloom window. I grew a number of Peony Poppy, a beautiful pink and purple tint, whose bloom lasted less than a week. After that were a multitude of pods. But, those pods in their own right are actually quite beautiful. Like any other garden plant or landscaping they can be placed in an area that provides a backdrop or something within them to replace the shock of having nothing there by mid July. Thanks for the post MrBrownThumb! This was a really fun read! Scott, Thanks for the feedback on my post on transplanting poppy seeds. Also, thanks for the tip on growin Icelandic poppies. Just what I needed to know. Thanks for the helpful article & the clear picture examples. And now I'm off to do some transplanting! Curious if you grow Papaver Bracteatum, "the Great Scarlet Poppy?